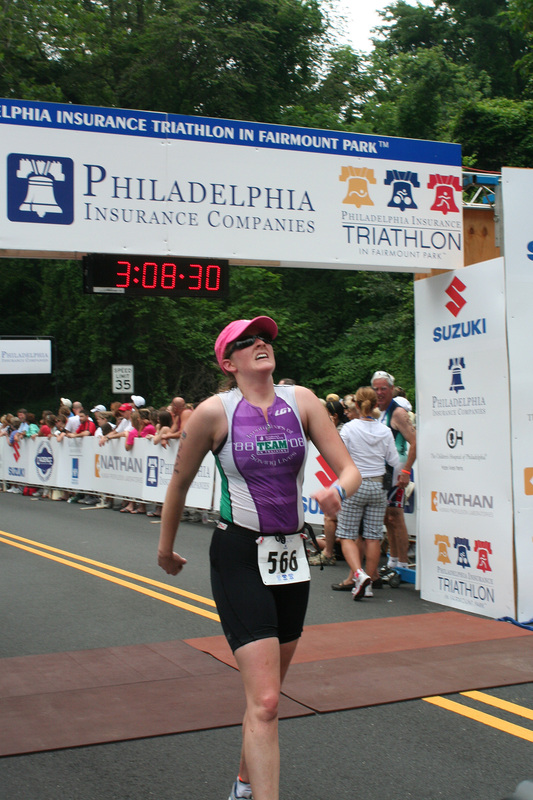 My love affair with triathlon began in 2008 when I signed up to do the Philadelphia Triathlon (now a TriRock event) with Team in Training (TNT). I was a few years out of college and looking for a way to stay active. 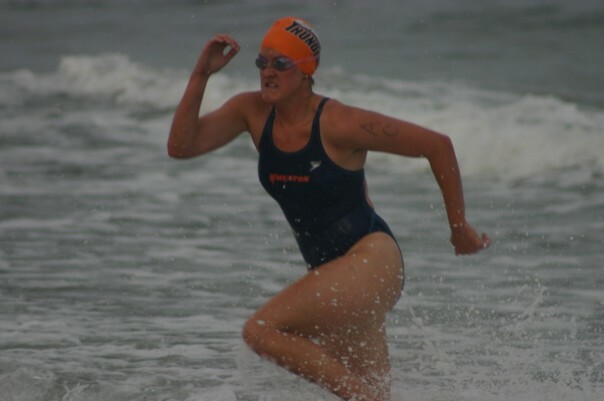 I had been a swimmer in college and tried to keep up my fitness after college by running. Running itself was fun, but something was missing. I’ve always felt most “at home” in the water- perhaps it’s because I’m an Aquarius or that I grew up only blocks from the Atlantic Ocean- and I was itching to get back in the water, but on my terms. No more two hour practices! Open water swimming is my favorite kind of swimming. This is a lifeguard race, summer 2004. Triathlon would get me back in the pool with reasonable practices, keep me running, and introduce me to cycling. I remember showing up for my first TNT bike practice. It was a Saturday, a chilly February day in Washington, DC. 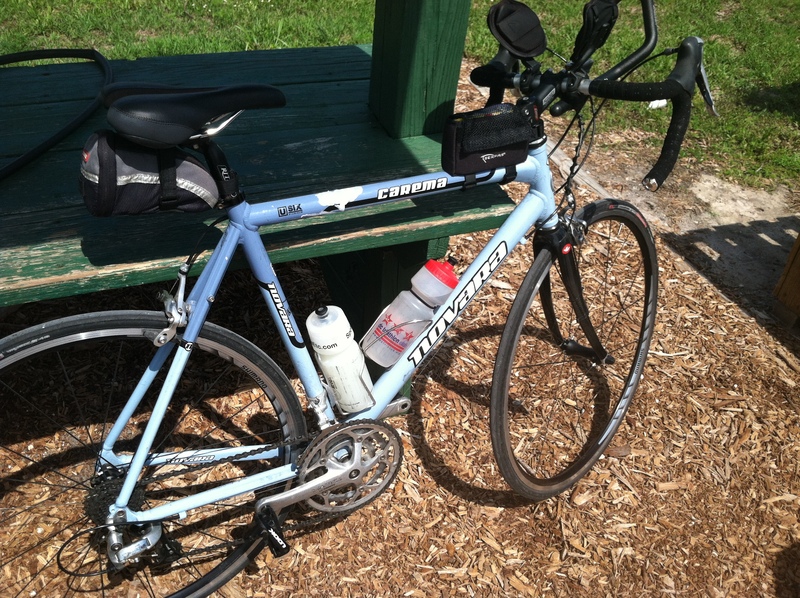 I had recently purchased my first ever road bike from Craigslist, a pretty blue Novara. 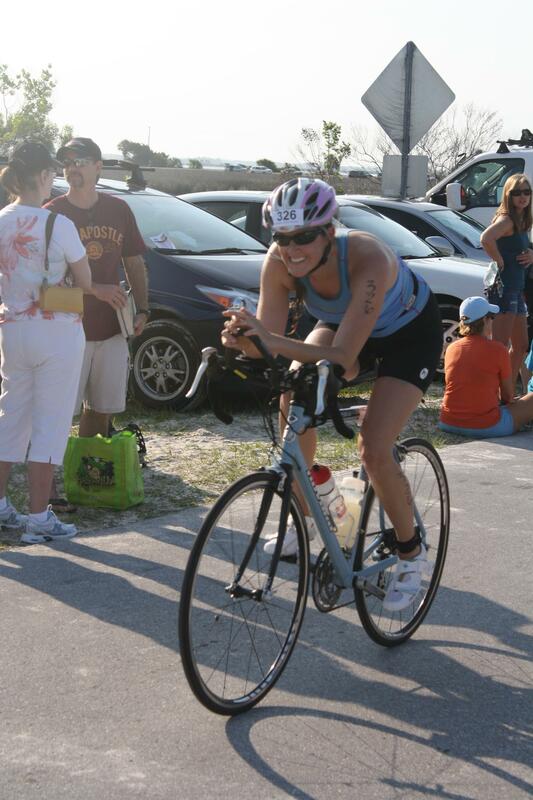 This picture was after I embraced triathlon enough to add on aero bars. I showed up with my bike, having only been in the saddle for the 2 minute test run in the parking garage of Whole Foods, where I met the couple who was trying to sell the bike. During my test run, I nearly fell onto one of the parked cars as I tried to mount it. Totally embarrassing. Anyhow, I showed up to our first team practice wearing my Columbia ski jacket, sneakers, a pair of those 99 cent one size fits all gloves, and my new charcoal grey flared yoga pants that I had purchased especially for this occasion. Boy, do I wish I had a picture of myself! One of the coaches quickly pulled aside me and some of the other newbies and she duct taped my right pant leg so that it wouldn’t get caught in the gears. Oh, so flared pants weren’t appropriate attire for biking. Noted. She also let me borrow her actual riding gloves to go over my cheapo cotton gloves. We set off as a group for a short ride in Rock Creek Park. I don’t remember much about the ride, other than feeling a little shaky and scared at first, but then the sense of freedom I felt as I flew down the open road took over and I was hooked. This was definitely something I could get in to. The Philly tri was my only race that season, and I definitely had a good time. 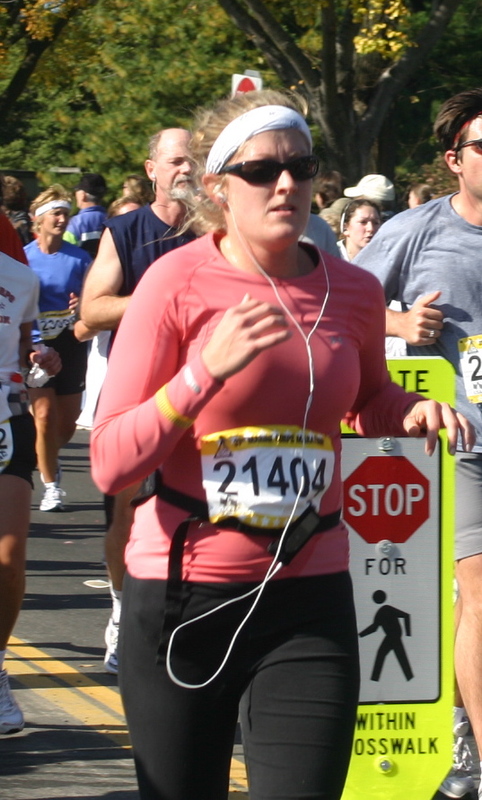 I remember it feeling so hard- especially that run- but being so happy to finish and so proud of what I had accomplished. 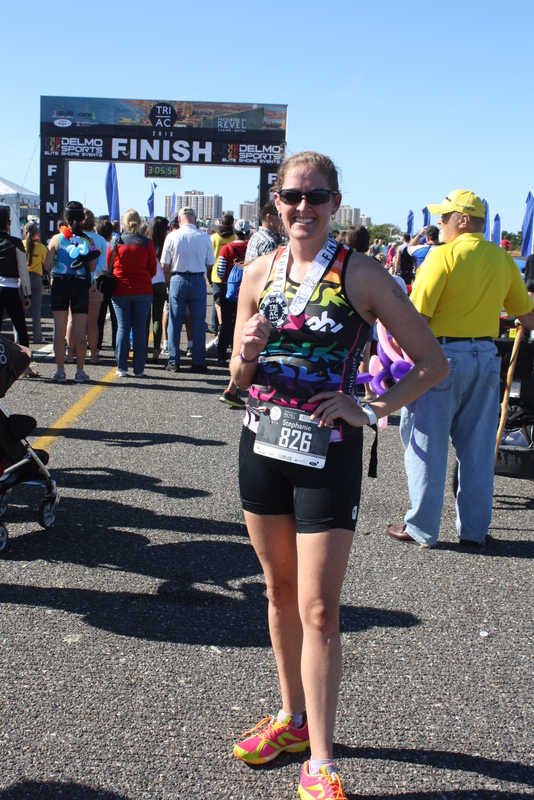 Five years later, and I finally feel like I’ve come into my own as a triathlete. I laid down some pretty serious mileage on the bike, with my longest ride being about 75 miles. I PRed my 10K on the run leg of an olympic tri. I placed in my age group in three out of the fours races I did this season. I finally completed my first half ironman. Triathlon has got a serious hold of me. I love being part of this community. I love the sense of accomplishment after a tough workout. I love pushing myself to see how far I can go. 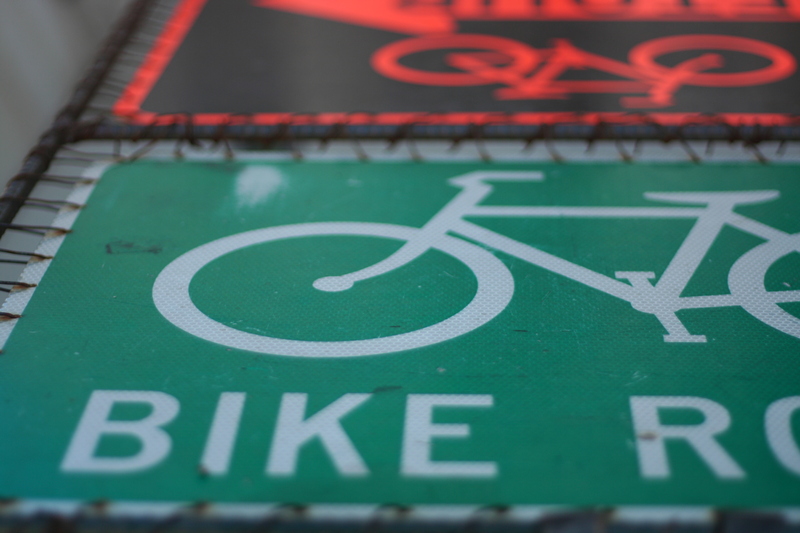 I love that my body allows me to swim, bike, and run, while most people just stick to one of the three. Since my race last weekend, I’ve done absolutely no working out. I know my body needs this time off so I can come back and be physically and mentally rested and ready to train again. I may not be training, but my teammates and I are talking about training. We’re already making plans for what to work on in the off season and drafting a 2014 race schedule. Nothing is set in stone yet, but I can tell you that we’ve got big plans for next season. 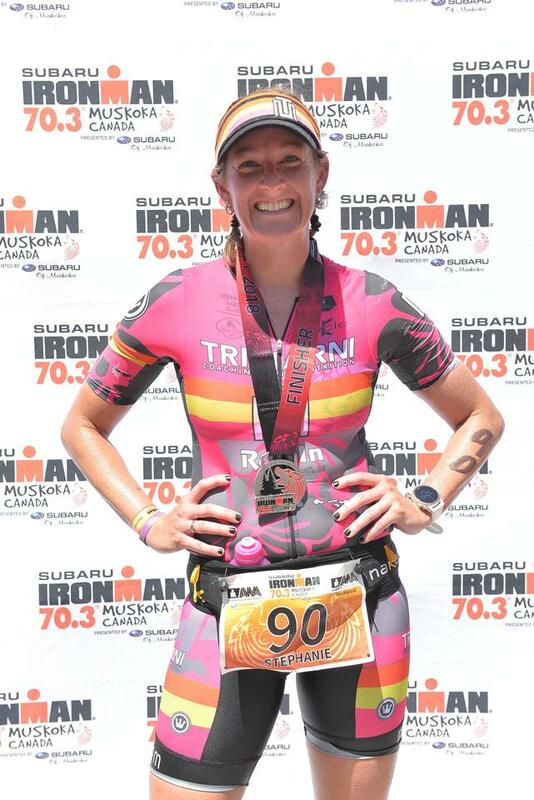 So I say farewell to the 2013 tri season with a big smile, blessed to have had such a great year. Thank you to all my lovely readers for all your love and support. Your comments, tweets, and messages truly make blogging worth it. 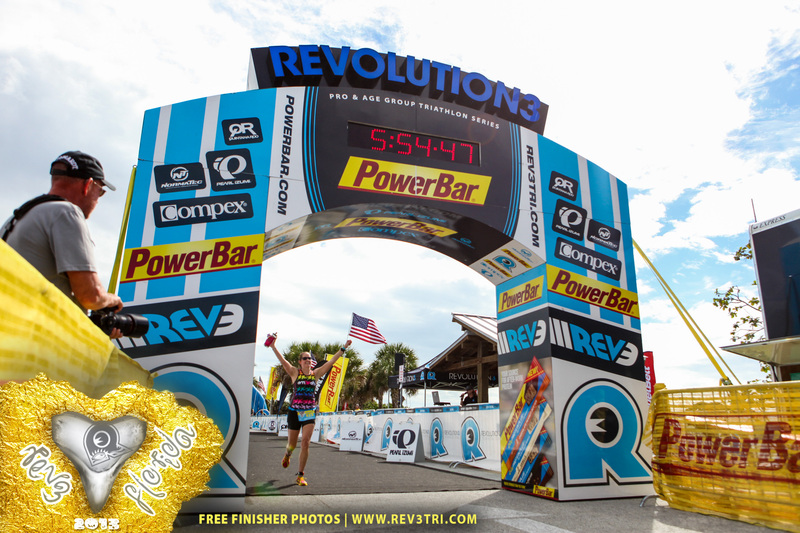 I love sharing my triathlon journey with you, and hope you’ll continue to follow along! i loved loved loved this! I actually laughed out load at some point! I am going to be asking you lots of questins this year, be prepared and so proud of you!